If you’re coming from a ‘physical’ (i.e., office-based) team, then you’re about to enter a very different world; one that requires you to communicate and behave quite differently. Before we even get into tips and tricks, you’ll need to reset the expectations you have of your coworkers and start thinking like a remote worker. Trust people: It’s the only way any remote communication works and the most important rule of all. Building trust in a physical environment is much different than building one remotely. You can’t walk by their desk, you can’t mingle at the water cooler, you can’t go out to lunch together, and you might not even ever work with them in real-time at all. Bottom line: You’re going to feel like you’ve lost a lot of control. Communicating properly will ease your trust issues with others, and this guide will help you with that, but you have to commit to starting with trust. Respect people: You’re likely going to be working with people from all over the world, with many different cultures, beliefs, and backgrounds. Your communication has to become more respectful than ever before, keeping in mind everyone’s thoughts before going and posting your heavily political commentary in the #random channel on Slack. Value everyone’s flexibility: No one joined your remote company so they could attend 3 a.m. meetings every week. They joined for the flexibility, so respect that and use this guide to avoid disrespecting it. Don’t drive yourself crazy: You’re about to experience more text-based communication than you’ve ever had in your life. Entire meetings with 10+ people will take place via chat. But don’t take every word so seriously or harshly, as chances are people aren’t flaming with rage but rather miscommunicating their actual tone. Always respond respectfully. Don’t assume all text is with a negative tone. Don’t freak out when someone suddenly goes AFK; they aren’t devising ways to trick you with a response, they probably just went to the bathroom. Don’t drive yourself crazy creating illusions of people’s negativity, lack of working or scheming against you until you have significantly more actual evidence. One of the reasons companies are able to be fully remote today is because of the tools that now exist. None of this would have been possible before them, and they only keep getting more and more powerful and efficient. As a remote team, you’ll spend the majority of your time communicating via text, and thankfully there’s an awesome app for that called Slack. This app will literally become your new office. It allows you to create communication channels for individual teams and projects, as well as water-cooler-like, interest-based channels about things like travel, cooking, gaming, etc. Slack has competitors like Hipchat, but don’t waste your time — Slack has the most 3rd party application support, a massive app store, and the best UI and design. Unfortunately, your relationship with Microsoft must come to an end. Google has everything you need and will make your life much easier at the price of $5/user/month. Your e-mail, calendars, spreadsheets, documents, presentations, and more will now be available to you anywhere and collaboratively. You won’t find any remote team today using Microsoft’s tools, so just make the switch, and you’ll be happy you did. For video meetings, there are two options to consider: Zoom and Google Hangouts. Both are free, although Zoom comes with some restrictions (40-minute maximum meetings) unless you pay. Hangouts is well-known for sucking your battery dry, dropping calls, and being overall terrible. That said, it’s still one of the best options available, it integrates with your Google Calendar, and it’s free. Zoom can host hundreds of people in a single video conference, which is pretty amazing to experience. The quality is certainly better as well. It also is less likely to horribly crash and burn on you like Google Hangouts, so if you have some budget, invest in a tool that’s going to give you big, consistently quality meetings. Since you’ll be sharing a lot of files with one another and won’t have your usual internal company drives anymore, you’ll need an online equivalent. GDrive (or Google Drive) offers the best bang for your buck and will be nicely stored within your existing GSuite environment. No one comes close to the amount of service and storage they offer, and their price beats every competitor as well. One incredibly important, and often overlooked, tool for communicating with your team is Google Forms to help send out surveys. Feedback is so important in a remote team, because you don’t see people’s faces on a daily basis and you don’t always know how they’re feeling or truly responding to what you’re doing. Google Forms lets you insanely quickly create a feedback survey, send it out to the company, and instantly start getting feedback — all for free. Use this tool and use it often if you want to keep a happy, engaged remote team. You likely already have a go-to project management tool you like, and we recommend continuing to use that. But for more everyday remote communication and keeping everyone on the same page about a myriad of different, tiny projects, something lightweight like Trello can come in handy. For example, you can use Trello collaboratively for sharing blog post ideas (and their current status), sharing links to include in your newsletter, doing quick-and-dirty bug tracking, sharing team-wide goals, etc. You can check out those examples and more on Trello’s inspiration page. Newsletters are a great way to engage your team on a monthly basis and keep them connected to the roadmap and vision you have for the company. Mailchimp is one of the best solutions for newsletters. It’s affordable and helps you easily create attractive newsletters and manage your subscribers. It also comes with plenty of automation tools, allowing you to send out a string of e-mails, particularly helpful for something like onboarding e-mails over the course of a new employee’s first two weeks. Sometimes communication is best left to the robots to do for us. Zapier is the ultimate robot for helping keep your team informed about, well, anything. If there isn’t an official Slack integration for something that you need your team kept up to date and informed about (such as new leads coming in, or visitors on the LiveChat), Zapier can rig it up for you with their easy to use service. Just pick a trigger (leads form submitted) and a destination (Slack), and it’ll send the information however you’d like it and to whomever you’d like it to go to. It’ll even handle your social media communications for you as well, posting to Facebook, Twitter, etc. all at once. Howdy: With people in ten different timezones, it can take a while to collect simple information from all of them. Sometimes, you’ll find Howdy comes in handy as it will go collect that information for you and tell you when it’s done. VacationBot: Your team will often post in Slack that they are going on vacation in a month, and then everyone forgets. VacationBot automatically sets their status to “OOO” and includes the date when they will return so that no one has to remember when you’re on vacation ever again. Donut: This bot will connect your teammates randomly with one another in a private chat so they can meet and talk with someone new each week. It’s an awesome way to meet new people. RightGIF: Our favorite of the GIF bots, simply type “/gif” + [a phrase], and you’ll get a gif delivered instantly to the chat. A must-have for any team that wants more friendly communication. Geekbot: A helpful bot for poking your team for status updates on a daily basis. Browse more communication Slackbots here. On a remote team, if you’re doing it right, then you’re communicating 90% via text. This thought scares many people coming from an office environment, but it’s actually a huge advantage. Why? Because it means you are documenting everything. Accessible — access information anywhere, no matter where you are, in an instant and without having to ask people again for it. Searchable — never lose information and easily find it again when you need it or want to reference it in another message. Centralized — when information is centralized to text, it becomes a single source of truth to follow, rather than depending on what Bill said in the hallway. Reusability is, in fact, one of the greatest benefits, as it’s very difficult to scale teams without good onboarding documentation (something most teams lack). When you’re remote, you are forced to document your processes in order to more easily onboard new team members. You are forced to create and maintain Google Docs that explain roles, values and how to do certain tasks — there’s no easier way to communicate those things than through text remotely. Even better, those new team members being onboarded become responsible for updating that documentation as they learn from it, meaning your onboarding documentation is continually improving, all thanks to being restricted to text communication. Onboarding side note: Consider adding Donut to your Slack team to help new team members meet people throughout the team each week. If there’s anything you read in this entire chapter, please make sure it’s this section. This technique not only completely changed our company for the better, it has changed many other companies for the better as well. Explained briefly: Journaling is a technique you can use in Slack to build trust and give your teammates a window into your mind and daily progress. Journaling is the ultimate solution to help teams trust one another, collaborate more frequently, deliver feedback more frequently, and share their daily progress. How does a journal work? You can create a journal in Slack by simply creating a channel named “[your-name]-journal” and then invite your team into it. Boom, done. In this channel, you’ll be posting updates about what you’re working on, bigger ideas you’re thinking about, and anything you’re interested in feedback on. A journal is aimed at a small audience, such as the team you are on. Ideal journal entries are short and raw. You don't need to worry about perfecting your wording. It's a low-friction way to share your thoughts with the rest of your team. A journal is updated more frequently than a blog. At least once per day. Probably more. Your journal is part of an ongoing conversation. It will give your team-mates a window into your mind. “Hello World”: This is a great first post for your journal, especially if you’re new to a team. It’s an opportunity to post a bit about yourself, your working hours (and timezone), show off your work environment/desk and favorite places to work from, etc. For more tips on what a great, informative and visual progress post looks like, read this blog post. Today I Learned (TIL): TIL posts can be really short. They show one thing you learned while working on the project. Sometimes, it's something very specific to the project, like a significant requirement that you found while digging through some docs. Sometimes it's more general info that you discovered or remembered along the way, like a debugging technique or handy bash trick. Start looking for those little 'learning moments' in your day, and quickly jot down some notes in your journal. Remember, keep it quick & raw. If others read it and have questions, they can ask for more info. Try to keep it down to a couple of sentences and maybe a code snippet or screenshot. It's easy to fall into the trap of thinking I won't share that TIL, because everybody probably knows it already and then I will seem dumb! Or what if I'm wrong, and there's actually a better way to do it? Maybe they do, but maybe they don't. Only someone very arrogant will think badly of you at this point. That's their problem, not yours. Again, don't let this stop you. If somebody else knows a better way, this may be your golden opportunity to learn it! They might have been avoiding sharing this knowledge for the very same reason described above! This is your chance to break the cycle. Reflection: After a day of programming, describe something you observed and why you liked/disliked it. It's helpful to write reflections on your own code as well. We don't always have time to complete everything to the level of perfection we hoped, so this is an opportunity to add more context to any rough edges you may have had to leave behind. Request for feedback: Sometimes you might have a random idea that you haven’t fully thought through but want to toss into your journal so you can remember it, but also to see if anyone can help you run with it some more. These posts can prove incredibly valuable, as great ideas blossom from them and journals are a great place to post them so that no one feels pressured to necessarily respond to them (if they don’t like the idea) unlike in a normal channel. A common reason why teams avoid working remotely is because they can’t work together at the same time due to timezones. But this should never be an issue if you are utilizing text communication properly. This is where building discipline in being proactive becomes essential. When you get blocked on a task because someone is asleep, you don’t sit and wait for them to wake up. Instead, find other tasks you can work on until that person is back online. If there are no other tasks, work on new ideas. If you are sharing tasks with someone else on a project in a different timezone, plan out all of the tasks at the start of the week so that you can capitalize from the differing timezones and create a 24/7 work cycle rather than constant disconnect. Always share your progress at the end of your day and any important notes that the next person coming online might need to know about in order to be fully productive with their tasks. You might think your world and your tasks have no impact on others, but often, they do, and it’s important for your team to have a full picture of what’s happening before they jump into their own work each day, as it might impact them. Bonus: One helpful tool from the team at Buffer is Timezone.io, which will help you keep track of where your team is and when they will likely come online again if you want to sync up. A common tradition in any remote team is the daily standup meeting, a time for each developer to report on their progress from yesterday and what they’ll work on today. This is still an important technique to use in a remote team as well. If you aren’t adopting the Journaling technique detailed above, then you can use Slackbots like Geekbot to help ping your team each day for a daily update. Make sure, however, that you are getting informative, visual and consistent daily updates from all of your developers. For more on how to achieve those high-quality updates, read this blog post. When text becomes 90% of our communication as a team, it’s incredibly important that we make that text as expressive and emotional as possible to ensure people understand how we are communicating each line. With emojis, live by this rule: you can never use them too often. Just five years ago it was a sin, but now it’s a necessity. What it means is that if you find yourself ending ten sentences in a row with a smiley, it’s totally fine. Why? It means you’re reinforcing the emotion and expression on your face tied to your messages and ensuring there is no misinterpretation. And that’s key to it all — never let a message be sent to someone without an emoji if there is even a slight chance it can be misinterpreted as negative. “There’s nothing wrong with what you just did.” vs. “There’s nothing wrong with what you just did :)” One is aggressive, the other is comforting. “Can you send that to me? Thanks.” vs. “Can you send that to me? Thanks :)” One sounds concerned, the other is grateful and pleasant. Use emojis to your advantage to help show the expression on your face as much as possible. Emojis can also be dangerous when more vague reactions are used. Stick to emojis that have clear messages. In addition to emojis, it’s also important to lighten up our heavily text-based conversations with some lighthearted humor, the same way we might do in-person through various gestures. This is where GIFs come in handy. There’s no better way to lighten up a conversation than by pulling out a GIF. Install Slackbots like RightGIF or GIPHY to instantly pull GIFs into conversations. As great as GIPHY and RightGif are, however, nothing beats creating custom GIFs to express yourself. 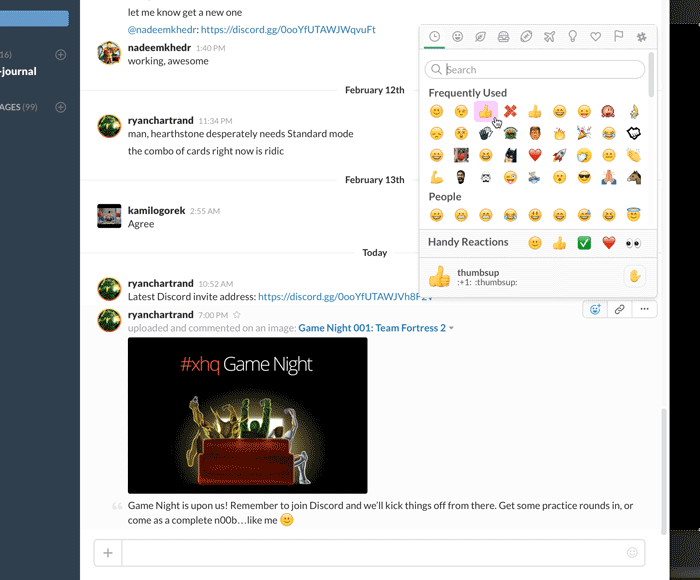 If you really want to build camaraderie and engagement with your team that’s meaningful and memorable, your team’s own GIFs will always win on Slack. You can easily make your own GIFs from your webcam with sites like andtheniwaslike. For more ideas on creating GIFs within your team, check out this blog post. Last but not least on our journey through text communication in remote teams is one of the most simple and most important techniques: always acknowledge. When you speak with someone face to face, you say something and they nod. We use these non-verbal signals to show someone that their message has been received, thus creating confidence that something will get done properly. So how do we signal when we communicate over text? Alice: hi @Bob, when you deploy the latest version you'll need to migrate the database. Bob: Got it, thanks. I'll migrate the db immediately after the deploy has completed. Alice: thanks! But remember, you can't do it immediately after because you'll need to give some time for everything to sync after the deploy. Usually takes about 10 minutes, so check that it's completed first and then go ahead with the migration. Conversations like this are the seeds of great documentation. For bonus points, Bob can offer to add some process notes to the wiki. Good on you, Bob. For the other 10% of your communication, it’ll be either in-person or video calls with your team. 2. A way to build camaraderie and better relationships. One of the mistakes new remote teams make is that they try to treat remote communication the same as office communication. However, the two are very different scenarios. When people are trapped in an office for the same 8 hours each day, it’s much easier to gather them into a conference room to hash out a problem. When your team is remote, however, gathering everyone can not only be a scheduling nightmare, it goes against the entire reason they joined your company. They signed up for flexibility, not waking up at 3 a.m. to resolve something that could have been solved via Slack and a Google Doc. When should a video meeting be held? Slack messages, privately first and then in a group channel if others are involved. Google Doc detailing the topic, allowing for comments and further collaboration. Record a screencast video explaining the situation or idea you’re proposing, using your voice and tone to further explain the situation, but allowing them to watch on their time. Drawings, sketches, or mockups that help explain your vision. Monthly announcements: We’ll get together once a month on video to discuss upcoming initiatives. These are moments for building relationships beyond just text, an important part of working as a team to ensure empathy and respect are always present. What video meeting service should I use? Your two best options are Zoom and Google Hangouts. Both are free, but Zoom restricts you to 40 minute meetings unless you pay. It’s affordable, however, so definitely consider it, especially as it allows hundreds of participants to join and can show you all their faces at the same time. Google Hangouts is the most popular option currently, but its bugginess and difficulties with connections can make it a bit frustrating, so you should consider upgrading to Zoom after you get your team off the ground and running. One of the most overlooked forms of remote communication is putting a strong focus on company-wide communication. Remote teams are incredibly productive because of how focused they are on actually getting work done. However, with great focus, you can easily forget about responsibility. Without physically seeing that daily reminder that you are responsible for human beings who depend on your leadership and communication to move forward, it’s incredibly easy to forget to focus on company-wide communication and keeping people moving forward together. The most basic company-wide communication that your managers should build discipline in doing for each team every month is a simple progress update. Ideally, this goes in a company-wide channel to showcase progress from every team (it also depends on the size of your company how you approach this). A recorded video (either a presentation recapping progress, or go all-out with an entertaining video recap). If you record a presentation, also share the slides separately and consider allowing comments on it. This will make everyone feel part of the progress of the company as well as feel part of something bigger. In a remote team, this is absolutely essential to keep your teams motivated and taking every day seriously. In addition to the monthly progress updates, it’s important to host a monthly Town Hall that shares that progress in a more fun way but also creates a forum for the team to discuss and ask questions about progress or direction. At our Town Halls, we first stream an entertaining custom-made video and then host a Zoom chat that can support anyone and everyone to join in and ask questions and comment on the current progress and future plans. With the great focus that comes with remote workers, it’s very easy for them to miss important announcements. That’s why you need a strategy that ensures important announcements are posted in several places, not just one. 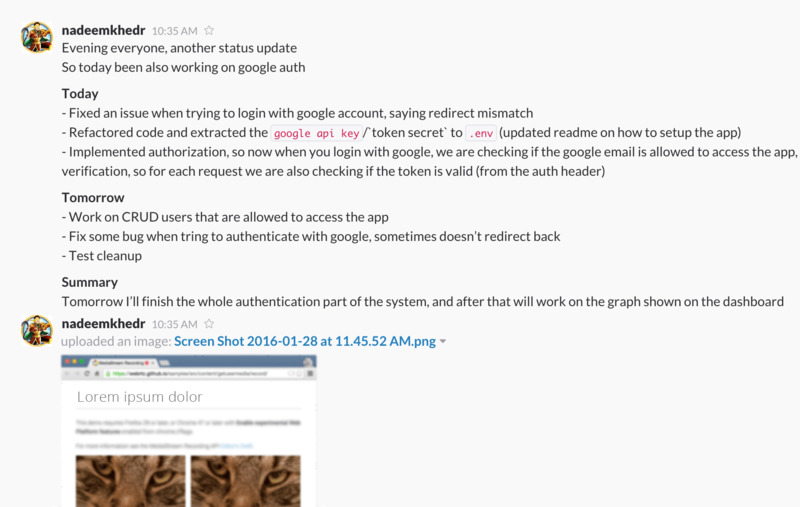 Slack: Convert your #general channel in Slack into a channel where only admins can post. Follow these instructions to learn how to do that. You can also rename the channel to something like “#announcements”. Ensure this “#announcements” channel is also a default channel for all new Slack members. You can learn how to do that here. All important announcements should then be posted here. Finally, to ensure people pay attention to each announcement, they’ll need confirmation from their peers that it’s worth reading. 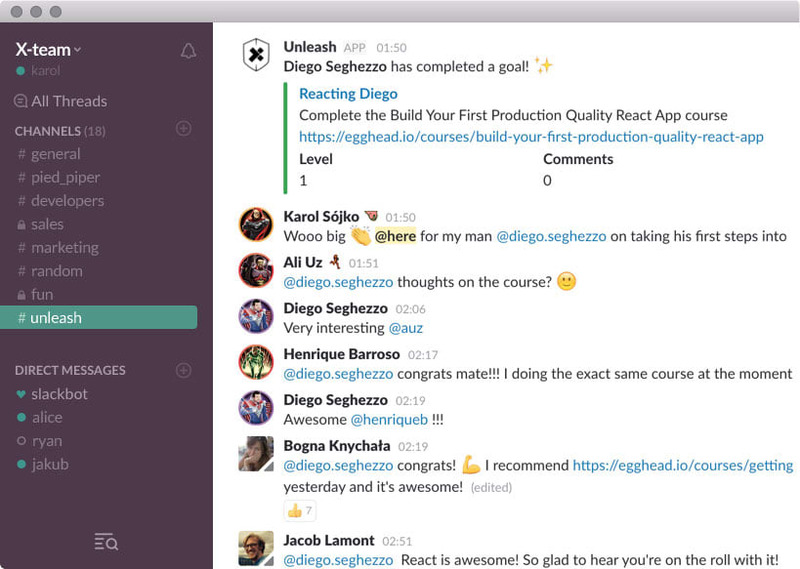 To encourage this, make sure you add reactions to every announcement post you make on Slack. For more strategy on this, check out this blog post. E-mail: Most remote teams don’t check their e-mail often and rely more on Slack for communication, but it’s still an important channel to make sure to hit with important announcements. For those who do read e-mail, they are likely to spend more careful time reading the content here than in Slack. Town Halls: Take advantage of the mass attention these get and include important announcements here. Always make sure to reiterate announcements from Town Halls with Slack and e-mail messages as well. Other places: Look deep into every remote communication tool you use and ask yourself whether a) this tool gets high traffic from employees; and b) if you can insert content into it, such as announcements. We found multiple interesting locations, so give it a go! When a new employee joins a team in an office-based company, you get the tour around the building and meet a lot of new faces. It’s an exciting experience, and it’s one you can recreate with remote teams as well. Aside from the obvious way of introducing new employees to your main channel (“@group: Everyone welcome @joe to the marketing team!”), you should also have a separate, dedicated channel for diving deeper into introductions of each new team members. It’s amazing what you end up learning from new teammates, as well as the conversations that stem from this content. It’s actually even better than the usual tour around the office filled with the same repetitive small talk. For more on this strategy, check out our full blog post on it. Communication doesn’t only happen online in a remote team, so long as you invest in and create opportunities for in-person collaboration, bonding, and learning. A meetup for each of your teams (or all of them together) is incredibly essential at least once per year to help build camaraderie, motivation and to help inspire new ideas that may never happen if you stay remote all year. 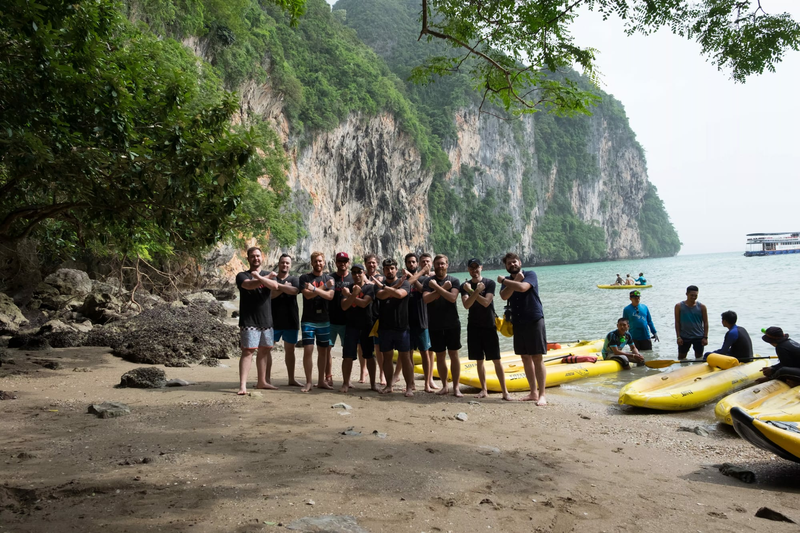 Aside from bonding activities, the best way to maximize the investment of a remote team retreat is to ensure you get at least five days of solid work in, focused entirely on retrospecting the past year and planning the year(s) ahead. Don’t use that time for solving challenges that can be solved via Google Docs and Slack — maximize this time for bigger, longer-term challenges that require true human collaboration. Although the cost of a remote team retreat can be costly (about $20,000 for your average team size of 10 people), you also to have to remember the savings you are already achieving thanks to not having an office. $20,000 is minimal compared to a 10-person office in San Francisco for a year. For more on how to host a productive remote team retreat, check out our in-depth blog post on it. Conferences are another great bonding and collaboration opportunity, as well as a way to help inspire and upgrade the skills of your developers. You can check out upcoming conferences for React and Node in our React Resources and Node Resources pages. Another great way to create the opportunity for in-person communication is by creating hacker houses. We created the X-Outpost, a roaming hacker house that changes cities throughout the world each month. It’s an open space for our developers to go visit where they can live, work and explore together. It creates incredible new bonds, inspires them, helps them collaborate on projects, and always results in new ideas being generated. This is the most casual of the three in-person options, and with the looser structure brings out different kinds of collaboration that you don’t get at conferences or retreats. You can learn more about how we created the X-Outpost here, or learn more about it overall here. If you want to know the first step to building a culture in a remote environment, it all starts with actively making an effort to celebrate every little win. Celebrating wins is simple to do and will undoubtedly lead to creating strong bonds, high morale, a supportive environment and a sense of unity for any remote team. 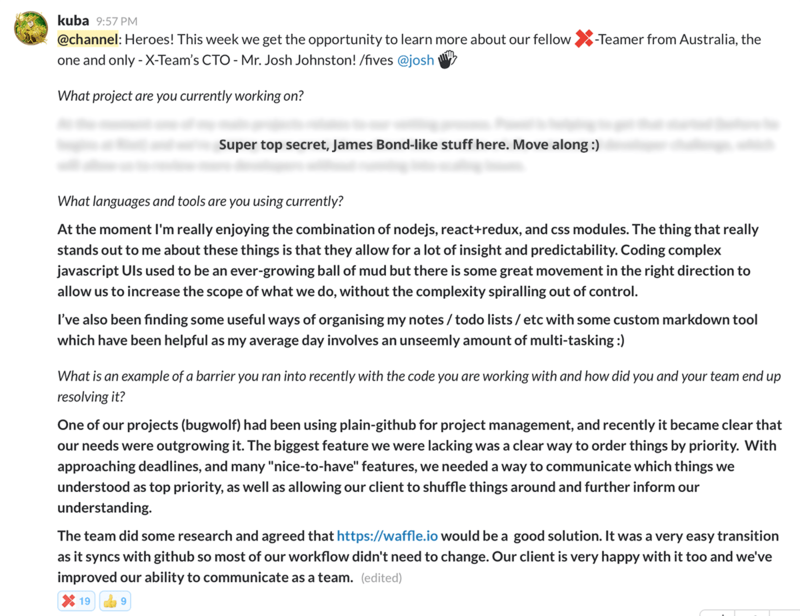 We took it as far as creating an application (and bot) that helps track everyone’s goals and shares them to a dedicated Slack channel (you can also just use Trello+Slack notifications). Celebrate the wins, no matter how big or small — it’s not noise. The more of them you have and encourage, the more you’ll create a positive, supportive, and motivated remote team environment.